Here is another guest blog post from one of our favorite military mommy bloggers, Samantha, from Hooah and Hiccups as part of our Military Appreciation Month. Throughout the month, look for more guest posts on our blog, our eBook becoming available Dec. 12th and our TroopSwap deal going live in the next couple of days. When my husband deployed to Afghanistan, I didn’t know how I was going to cope with not seeing him everyday, let alone for weeks and months at a time. We were no strangers to separation; prior to deploying, he attended Basic Training followed by Airborne School and even today, we have spent more time apart than we have together. However there were a few differences this time; an 8-hour time difference, fighting in a dangerous war zone, and no chance of bringing a cell phone. 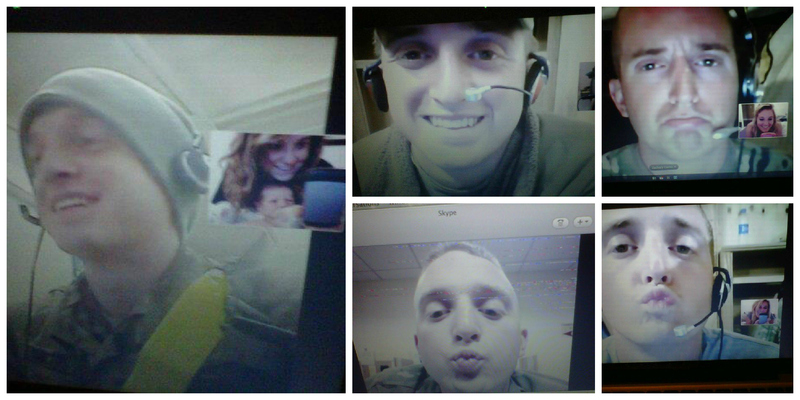 I had never really used Skype until my husband joined the military, and to be honest with you, I don’t know how I would have made it through deployment without it. There was something calming about hearing the Skype ringtone and knowing I could see his face, if even for a few seconds. The connection in Afghanistan wasn’t always the best; it’s in the middle of a desert in an undeveloped area. However, most of the time it worked like a charm and even if it was lagging or slow, seeing his face brought back butterflies every time. Due to amazing technological capabilities, I could even have Skype on my phone! Since it uses data instead of minutes, we were never charged for phone calls (and as you can imagine, calls from Afghanistan are probably not cheap.) I always had the app open which meant I never missed calls AND even if I wasn’t able to see his face, we could use it like a regular phone call. My husband missed my entire pregnancy while he was deployed. No one should have to experience a pregnancy alone, and no one should have to miss his or her child growing from week to week. Because of Skype, my husband was able to “be” at my doctors’ appointments and see my belly growing. This was a beautiful thing. It was 7 months from the time he left from the time he came back, and he was only home for two weeks before heading back for 6 more. I am not sure that I would have been able to stay as strong as I was without Skype; seeing his face through a computer screen was the most comforting thing I had at that time. It was the closest thing to “normal” for us. I am not sure the people at Skype even realize what they created or how much it impacted our lives. It was, at times, the only thing getting us through our day-to-day routines and at times, the only thing helping us survive a deployment.